7 way cord. Includes plugs compatible with BEC, Tamiya, Traxxas, EC3, Futaba & JR RX's*, plug with cap and extra set of insulated leads so you can customize with and 8th plug. Connect 1,2,3 or 4 MCX (Bind and Fly) batteries in series for faster charging on a single port charger. To be used ONLY when charging in BALANCE MODE. Connect 3 each 2S packs or 2 each 3S packs in series to charge as 6S assembly. To be used ONLY when charging in BALANCE MODE. The best way to charge packs that are being discharged in series. Balance harness from battery pack must be plugged into the balance connector immediately adjacent to the charge connector where your heavy wires are plugged in. Anderson Power Pole / Sermos charger cord added to one of our heavy duty cords. Standard 4mm banana on charger end. 4x Anderson Power Pole / Sermos charger cord added to one of our heavy duty cords. Length 12-14". Standard 4mm banana on charger end. Deans Ultra Charge Cord Silicone 11-12"
Genuine Deans Ultra plug added to one of our heavy duty silicone charge cords. 11-12" long with banana plugs for most common chargers. 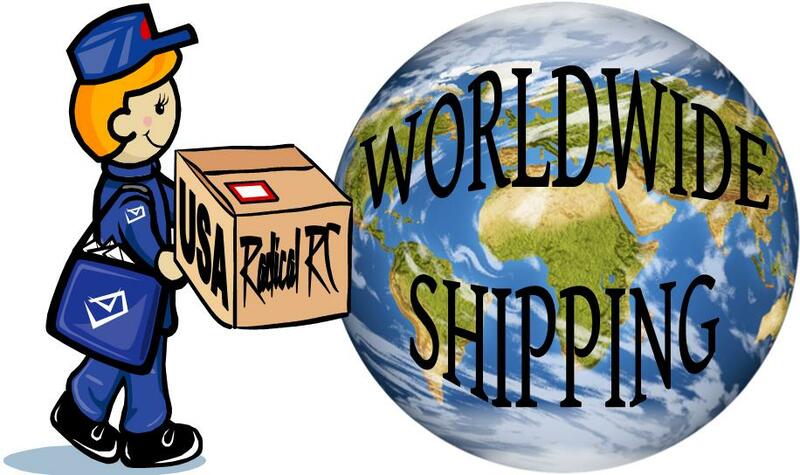 We use only Genuine W.S. Deans Plugs. Standard 4mm banana on charger end. 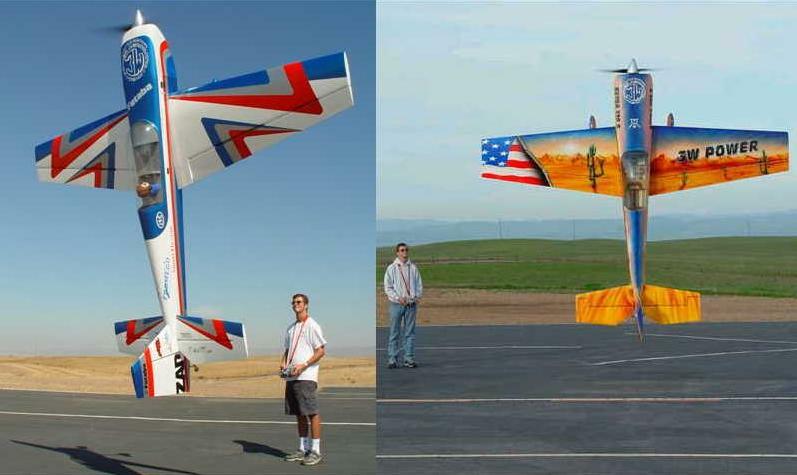 As per photo with caps. 12-14" Length. Heavy duty wire with standard 4 mm banana plugs to interface with charger. 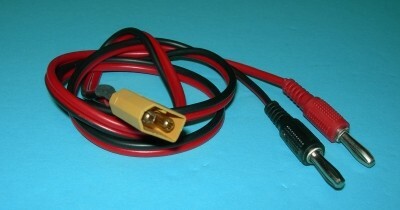 XT60 plug to one of our heavy gauge blank charge cords. About 18" long. Standard 4mm banana on charger end. EC3 plug to one of our 22 gauge bland charge cords. About 18" long. Standard 4mm banana on charger end. 4 Way EC3 Charge Cord. 12-14" Length. 12-14" length. Heavy duty wire with standard 4 mm banana plugs to interface with charger. 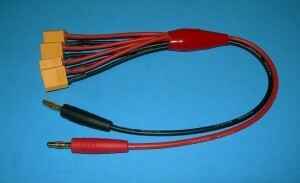 EC5 Charge Cord 22ga 16-18"
EC5 plug to one of our 22 gauge blank charge cords. About 18" long. Standard 4mm banana on charger end. 4 X EC5 plug to one heavy duty charge cord. Approximately 12-14" long. Standard 4mm banana on charger end. 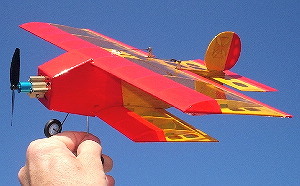 Red BEC/JST charge cord for the most common park flier battery packs. 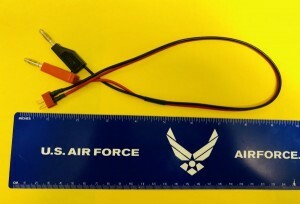 This is the same plug used on all the S-300 and smaller GWS birds. It's the only red plug with covered pins. About 24" long. Standard 4mm banana on charger end. This charge adapter cord lets you charge 3 MCPX connectored 1S battery packs as a 3S series pack. The cord must be used with a Balance charger AND it MUST be in balance mode. Just putting it in charge mode will damage the batteries. Be sure you advance your lipo menu to BALANCE. This way you get to charge 3 battery packs at one time on one port. The XH 3S balance connector plugs directly into your balance port or balance board. 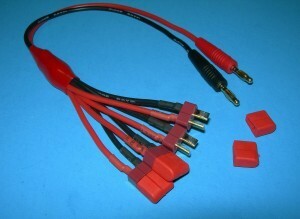 Use a Red JST charge cord to interface with the Red JST plug for the power input. Set your charger to 3S, your choice of charge rate (observe MFG reccomendations) in balance mode and your off to the races. With a 4 port charger, it's simple to get 12 battery packs charging at once. 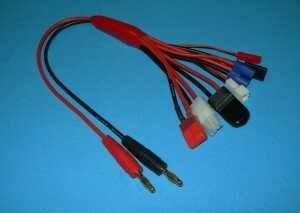 This harness has 3 inputs for the MCPX connector and can be purchased just to get these pigtails to remove for your own custom charge harness if you like. 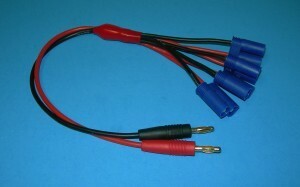 Multi Charge Cord with one each, Kyosho/Tamiya/Amp connectors on one end and standard 4mm banana plugs on opposite. About 24" long. 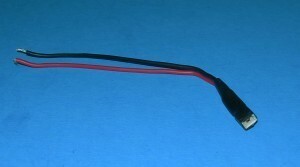 Kyosho Block MALE CLIP plug added to one of our heavy duty charge cords for you. About 24" long. Standard 4mm banana on charger end. 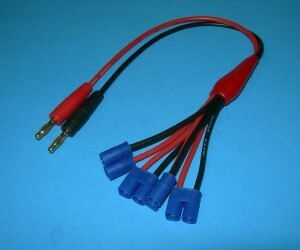 Kyosho/Tamiya Mini Male Clip Charge Cord on one end and banana plugs on opposite. About 24" long. Standard 4mm banana on charger end. 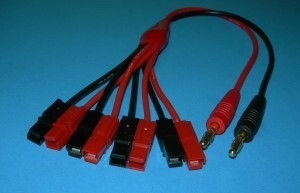 This charge adapter cord lets you charge 1, 2, 3 or 4 MCX bind and fly 1S battery packs in series. No need to fill it up, you can charge any number up to 4 in one charge session. The cord must be used with a Balance charger AND it MUST be in balance mode. Just putting it in charge mode will damage the batteries. Be sure you advance your lipo menu to BALANCE. This way you get to charge 3 battery packs at one time on one port. The balance end fits all the chargers we sell (excepting FMA Cell Pro) plugging directly into your chargers balance board port or 6S XH port. Charge input leads are standard 4mm bullets like all your normal charge cords. This harness has 3 inputs for the Single cell connector and can be purchased just to get these pigtails to remove for your own custom charge harness if you like. Also known as a Gold Stecker, cord fits Super Tigre and other battery packs using this plug. MPA is a Multi-Port Safe Parallel Module for safely interconnecting same-cell-count LiPo batteries in parallel; also supports RX/TX NiCds. 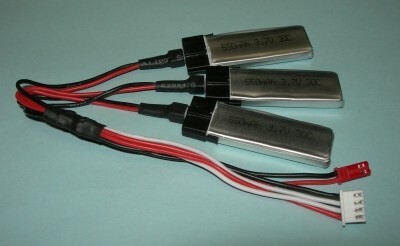 This version supports LiPo batteries with JST XH compatible balance connectors and Deans Ultra connectors. Interconnect cables available separately to support Cellpro PowerLab 6/PowerLab 8, Cellpro 10XP, and other charger brands compatible with JST XH balance connectors and wiring. 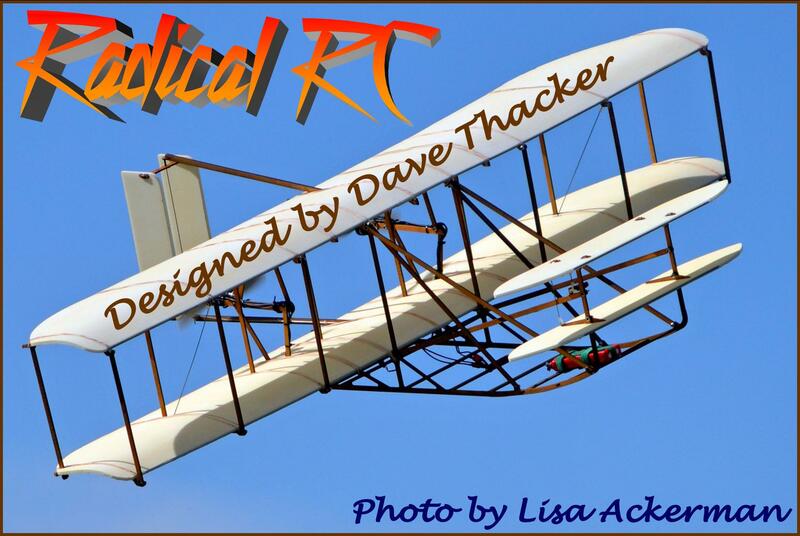 (Click here) for full details on this amazing new adapter, only from Revolectrix. 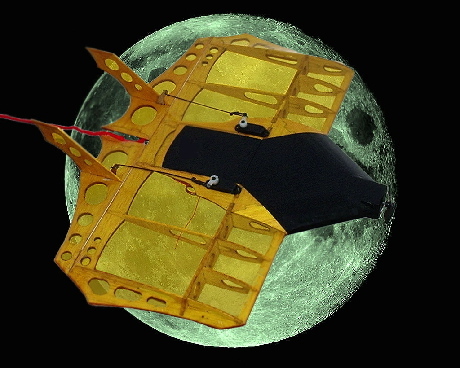 Unit includes: support for safe parallel charging of up to 6 same-cell-count packs at one time (2s-8s); supports 40A max charge/discharge rate; every port reverse polarity fuse protection of main battery wires; every cell/balance wire protected by self-resetting poly fuses with temperature warning indicators; supports non-balanced charge of up to two 1s LiPos used with "indoor models"; supports 1 RX and 1 TX NiCd/NiMH battery pack. 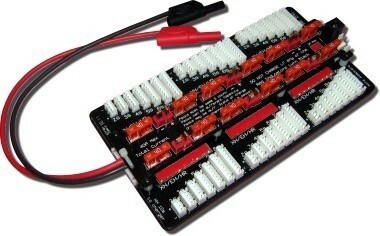 Works with any Cellpro charger or battery workstation equipped with "XH MODE WIRING" option. Interconnect cables available separately to support Cellpro PowerLab 6/PowerLab 8, Cellpro 10XP, as well as other brand chargers which are compatible with XH balance plugs and wiring. Be sure to purchase the proper interconnect cable to plug the MPA into your Charger or Battery Workstation.